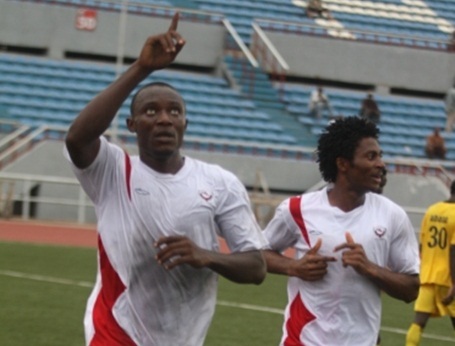 Youngster Brendan Ogbu is currently the top scorer of Enugu Rangers FC, often referred to as Rangers International FC. At the time of writing, Ogbu has scored nine goals in the Nigeria Premier League 2010-2011. Ogbu is a former player of the amateur club UNTH FC from Enugu. He joined Enugu Rangers FC in 2008 and as far as I know, the Nigeria Premier League 2008-2009 was his first season at top level of Nigerian football. According to my statistics, Ogbu scored two league goals during the season. The Nigeria Premier League 2009-2010 was a somewhat dissapointing season for Ogbu as he was primarily a fringe player, scoring only once during the season. The current season has been a major breakthrough for Ogbu. Ogbu started the season as part of an impressive striking trio together with Uche Nwofor (born 28.02.1989) and Fred Okwara (born 19.03.1989) and in January 2011, Ogbu was rewarded for his fine performances by being included in the squad of the Nigeria U-20 national football team. However, unlike his teammate Nwofor, Ogbu was not picked for the final squad of Nigeria U-20 for the 2011 Orange African Youth Championship, played in April / May 2011. Since Okwara joined Turkish side Adanaspor in January 2011 and Nwofor became busy with the Nigeria U-20 national football team, Ogbu had to step up his game. During February – May 2011, Ogbu excelled and cemented his place in the starting eleven of the ambitious club. On 11.05.2011, Ogbu scored his first ever hattrick in the Nigeria Premier League when Enugu Rangers FC crushed JUTH FC 4-0. At the end of May 2011, Ogbu struggled with a knee injury but he is apparently soon ready to continue his scoring spree. The date of birth of Ogbu is unknown to me. In early 2011, Ogbu was described as a teenager and in an article from MTN Football from May 2011, Ogbu was described as a 18 year old striker. According to the official homepage of Enugu Rangers FC, http://rangersinternationalfc.com, Ogbu is born on April the 7th. If Ogbu was 18 years old in May 2011, this should imply that he his born 07.04.1993. This would again imply that Ogbu was only 15 years old when he played in the Nigeria Premier League 2008-2009. Ogbu apparently comes from a sporting family. According to MTN Football, the father of Ogbu was a Nigeria international handball star, while his mother was a basketball international. The first name of Brendan Ogbu is continously misspelled. I have seen Ogbu being referred to as ”Bertrand Ogbu”, ”Bernard Ogbu”, ”Brenthran Ogbu” and ”Brenda Ogbu”. Nigerian media has previously described Ogbu as an ”unsung hero” at Rangers, but this belongs in the past. Ogbu is currently one of the hottest prospects in the Nigeria Premier League 2010-2011 and is definitely a player to watch. The picture of Ogbu is taken from MTN Football.Ogbu is the player at the left. I agree with you! Brendan Ogbu is one of the most interesting players in Nigeria and someone I will follow closely during the next couple of years. i ve watched some of Ogbu Brendan’s Games.the youngster is simply on FIRE..his really a GoalGetta.. and a soccer BrainBoX..tanx for this site. I am a long time follower of the West African game and this website is superb. One thing I’d like to ask is whether you would be willing to have an outlit for all this information you have? I currently research for the world famous Football Manager computer game. If you are not aware, this game contains a database of over 300k footballers worldwide (www.footballmanager.com) which are reserched and added into the database by passionate fans. Unfortunatly pretty much the only area the database falls down is West Africa. As a one of these researchers, I currently scour the web like you, often having to make assumptions, or put random pieces of information together to get details on a player. I have to admit, your current knowledge is far superior and up to date to mine and I think you would be a great, great asset to the African research team of the game. Is this something you would be interested in doing? You seem passionate and do the required work as a hobby anyway for this blog :), but the world could do with your knowledge. Anyway, if you are interested, let me know and sign up to the community forums (www.community.sigames.com) and I can introduce you.